I looked. My jaw not-literally-but-basically dropped to the floor. It looked like the above picture, only tiny, the size of a lentil perhaps. A teeny tiny snowflake. Amazing. I couldn’t get over it. “A snowflake! It looks like the pictures of snowflakes you see everywhere!” I said. 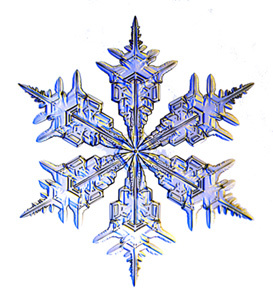 That’s when I realized that I’ve never actually seen a real snowflake that looked like a picture of a snowflake. They were all just wet blobs. Next subject: A bizarre phenomenon has started to occur in my life. Let me see if I can explain it properly. It started one night when I was thinking about this girl, and what I thought of her, when all of the sudden I realized that I was thinking of two girls. A girl named Jo that I recently met here in Virginia, and Michal, the girl who played Grace in “Annie.” It was really bizarre, like for a while they were the exact same person in my mind. And then I went to Backyard Bible Club and met this lady named Dawn. I knew exactly what her personality was like, and how I thought of her. But then I realized that I had just barely met her. So how could I know these things? Then I realized that my mind thought she was Kay, a lady who worked backstage at Annie with me. I blame it on meeting way too many people in such a small block of time. This entry was posted in Uncategorized and tagged showflake picture, snowflake, snowflakes. Bookmark the permalink. Yeah, snowflakes can be pretty interesting. Been a while since I’ve seen an individual one up close, though!